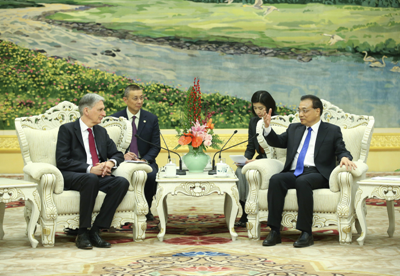 Premier Li Keqiang met with British Chancellor of the Exchequer Philip Hammond on economic and financial cooperation in Beijing on Dec 15. Hammond is in Beijing for the ninth China-UK Economic and Financial Dialogue. Premier Li said this year marks the 45th anniversary of the establishment of China-UK diplomatic ties, and the relations between the two countries have made continuous progress on the basis of mutual respect and equal treatment. Britain is one of the most open economies in the world, and China will open up even wider to the outside world, said the Premier, adding that China would like to enhance political trust with UK, strengthen cooperation in key areas such as trade, investment, and the third-party market. He expressed his hope that China and Britain will deepen financial cooperation by taking advantages of London as a major financial center in the globe. Premier Li also hoped that this round of economic and financial dialogue will lead to more mutually beneficial results. Hammond said as the bilateral ties improve, the two sides are offered new opportunities for cooperation. Britain is willing to implement all important consensus reached with the Chinese side, and deepen cooperation in the fields of trade and investment, finance and nuclear power, to create a “golden age” of China-UK relations, he said.